Gold prices advanced to their highest level in nearly six months on Thursday after losses across global stocks and a pullback in the dollar pushed investors into safe-haven assets. The market reached the $1266 level after prices broke above the resistance in the $1257-$1256 zone, but some investors used this opportunity to take profit. The XAU/USD is currently trading at $1259.55, slightly lower than the opening price of $1259.89. The bulls have the near-term technical advantage, with the market trading above the daily and the 4-hourly Ichimoku clouds. The Tenkan-sen (nine-period moving average, red line) and the Kijun-sen (twenty six-period moving average, green line) are positively aligned on both charts. To the upside, keep an eye on the 1262.50-1261 zone. 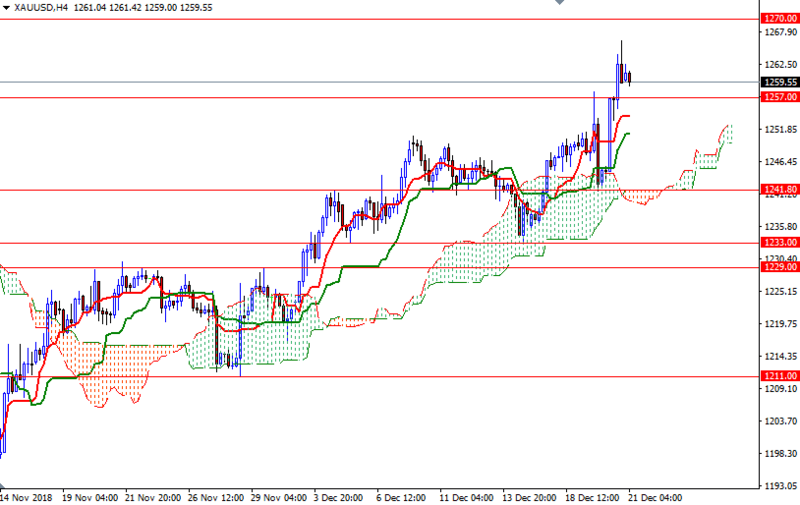 If prices get back above 1262.50, we may retest the strategic resistance at around the 1266 level. A break through there suggests that the 1273/1 area will be the next port of call. However, if the aforementioned barrier in 1262.50-1261 remains intact, XAU/USD could head lower to test the support in 1257-1255.80. The bears have to drag prices below 1255.80 to challenge 1254 and 1252/0. A break below 1250 indicates that the bears are aiming for 1248/7. Previous articleParty Like Its 2000 & 2007? Correction Or Bear Market In Play?